Juniata Valley Audubon Society's evening program series resumes at the Bellwood-Antis Library in Bellwood on Tuesday, September 19 with a program by raptor-banders Mark Shields and Randy Flement. 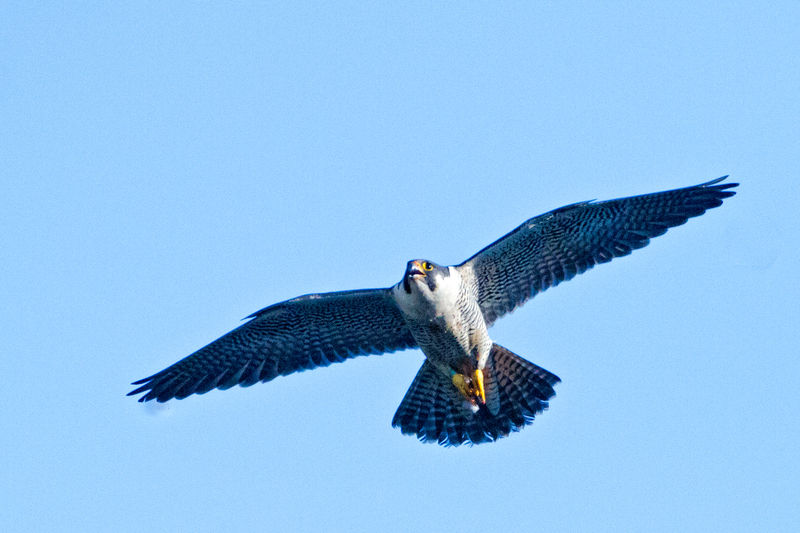 Peregrine falcons nest on rocky cliffs, under bridges, and on city buildings in Pennsylvania. This wild falcon was photographed by Mike Jackson as it returned to its nestlings under a bridge near Lock Haven. Mark and Randy's talk will cover the history of their banding efforts on Tussey Mountain, the size of the raptor flight, and the species of raptors that they see and capture, including photos of the birds in flight and in-hand. They'll also describe their trapping methods and banding procedures. A special part of the program will be an opportunity to see a live falcon — Mark’s Peregrine Falcon, Thistle. Mark Shields is a retired USAF officer. He worked as a raptor biologist prior to joining the USAF. He has been a falconer for over 40 years, as well as being a raptor propagator. Since 1983, he has been a raptor bander and has worked under four Master Bird Banders. Mark continues to stay busy as an artist making reproduction medieval artifacts. Randy Flament has been a wildlife photographer since 1980. As he says, "I just love being in the woods leaning as much as I can about anything in the wild." Photography allows him to share some of that with other folks, but he prefers to document seldom-seen behavior rather than just take generic portraits of animals. He has been working in the timber business for 40 years.